Military strength cotton web strapping combined with neoprene padding. Adjustable wrist support wrap for extra comfort. Improves grip with less finger and hand fatigue. Great for pull downs, shrugs, rows, dead lifts. Extra neoprene padding for greater wrist comfort. 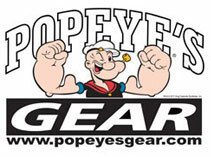 Comes in retail packaging with woven Popeye's Gear label. 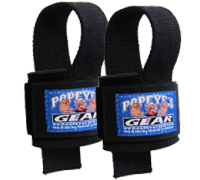 Great two in one product - Lifting Straps and Wrist Wrap Combination.